From PSIP’s annual Bard’s Birthday salute to Franktuary Happy Hour to Mrs Shakespeare on stage to BYOB, there’s a whole lotta Will for the 455th celebration! Where? All over town! Week Of Will 2019 starts with a warm-up on the eve of Will's birthday with Britsburgh and Prime Stage. Then our annual Shakespeare Birthday Tribute in Oakland includes Mrs Shakespeare's floral tribute and a treat in the Schenley Plaza tent, and moves to Franktuary to raise a glass to heroes during a happy hour fundraiser, then follows Mrs Shakespeare to Homestead (see event below), and winds back up for BYOB in Squirrel Hill, April 22-29! Follow our events here and on Facebook. Most events are free. 6PM, The Library, South Side. Tickets and more details. 7PM The Pump House, Munhall. Details below. 7:30PM Té Café, Squirrel Hill. Details below. 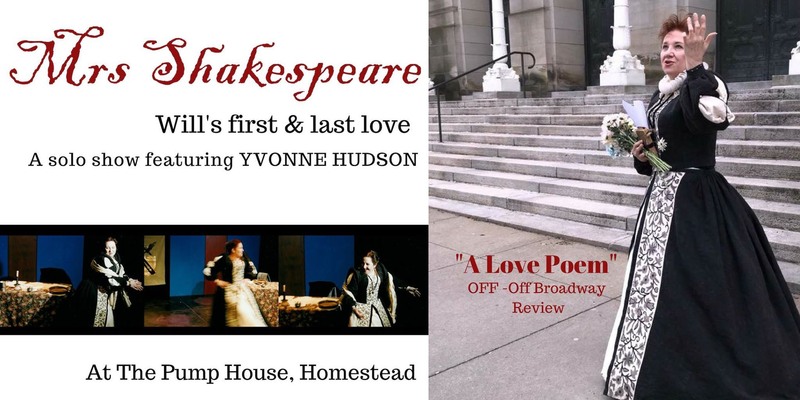 Sonnets, songs, and soliloquies--with references from some 20 plays--are woven into Yvonne Hudson’s imaginative script celebrating the triumphs and tragedies of the world's most beloved playwright and his wife Anne. Developed through ongoing research including work in Stratford-Upon-Avon and London, Mrs Shakespeare is the longest-running solo project featuring the character of Anne Hathaway, a farmer's daughter who married the man destined to inform the English language and theatre for the ages. The show introduces the mother of Shakespeare's children and the woman who bravely waited for him for more than two decades while he built a career in London. The setting? The Shakespeare’s home, New Place, in Stratford-Upon-Avon, Warwickshire and the memory of Anne Hathaway Shakespeare. Yvonne Hudson, who appeared at PSIP as Juliet’s nurse, appears as Anne Hathaway Shakespeare in her long-running, original one-woman show. Will's wife calls on her husband's works to tell the story of her marriage and motherhood. You'll hear Anne's tale of an unexpected courtship, resourceful parenting, and unrivaled resilience. 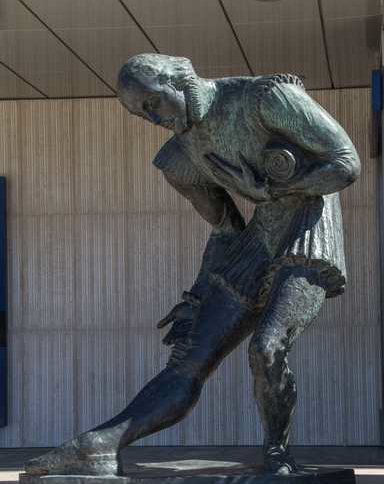 Yvonne weaves references to more than half of Shakespeare's plays into her script which includes monologues from Troilus and Cressida, Romeo and Juliet, The Taming of the Shrew, Henry VIII, and Henry V. Sonnets and biographical tidbits punctuate her story of the trials and triumphs of Anne and Will's life together and apart. Yvonne Hudson’s Solo Show Benefits PSIP. Venue: the historic and intimate Pump House in Homestead at the Waterfront. Accessible venue. April 27th, 7 PM. Thank you to The Battle of Homestead Foundation and Rivers of Steel, venue sponsors. Special thanks to Pittsburgh Parks Conservancy and Franktuary. Coming September 2019: Our all-female Julius Caesar! For Pittsburgh Shakespeare in the Parks’ 15th season, we will produce Julius Caesar, directed by Elena Alexandratos, who will cast women in all the roles. 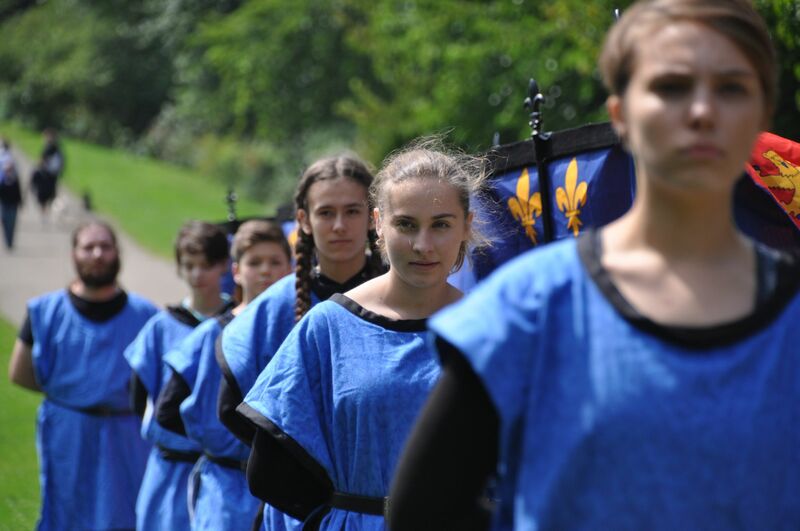 A 90-minute version of Shakespeare's The Tragedy of Julius Caesar will run Sept. 7-29 2019 in Pittsburgh city parks. Check back this summer for more info! Actors: Appointments for Julius Caesar auditions are being booked for Sat., April 27. Both AEA and non-union actors are sought for an all-female cast. Order clothing and gear with the PSIP logo or As Yinz Like It right here. Shakespearian monologues and scenes read by, well, anyone. Whether you are a seasoned actor or an energetic neophyte, whether you have a polished favorite or a monologue you are currently working on, all are welcome to perform their favorite Shakespearian verse in an informal and fun evening celebrating the Bard’s most famous and most obscure works. Come with a reading prepared, or choose a monologue from those brought along by host Alan Irvine, or just sit back and enjoy. BYOB is Pittsburgh Shakespeare in the Parks’ informal scene night in which professional actors and non-actors alike take a crack at their favorite Shakespeare pieces in a light-hearted evening of fun. WHERE: Te Café, 2000 Murray Ave. (at Beacon Ave) in Squirrel Hill. WHEN: Doors open at 7:00 PM, readings begin at 7:30 PM. Suggested $10 donation at the door. WHY: BYOB. For those who really want to read Shakespeare out loud and not worry about feeling foolish. WHO: All ages and levels of experience welcome to read or listen. Kids are welcome. Beverages and light fare available for purchase. All proceeds benefit PSIP’s Fall 2019 free production. May 27: Preview of the September show scenes. Pittsburgh Shakespeare in the Parks has been producing free public performances of Shakespeare’s works in the Pittsburgh city parks since 2005. In September 2016 we celebrated our 12th season of shows with 8 public performances of The Comedy of Errors, playing to over 1800 patrons that included people from surrounding counties and states as well as local community members. We had the pleasure of collaborating with the University of Pittsburgh Honors College to present a performance at Pymatuning State Park. And we inaugurated an ongoing collaboration with The Pittsburgh Cultural Trust, providing 2 private student matinees of The Comedy of Errors for a total of 5 public schools and 1 homeschooling group, as well as performing selected scenes as part of The Trust’s Gallery Crawl event. Thank you for your interest in Pittsburgh Shakespeare in the Parks. Please join us for our 2019 season! Do you like what we do? Want to see us do a specific show? Let us know!...on Facebook or via email at info@pittsburghshakespeare.com. "Like" our page on Facebook: Pittsburgh Shakespeare in the Parks. Read our blog: Pittsburgh Shakespeare in the Parks. Bringing free Shakespeare to the Steel City since 2005. Bring a blanket, a loved one, and a thermos. Pittsburgh Shakespeare in the Parks' productions are supported in part by the Pennsylvania Council on the Arts, a state agency funded by the Commonwealth of Pennsylvania and the National Endowment for the Arts, a federal agency.